Happy Anniversary to us! 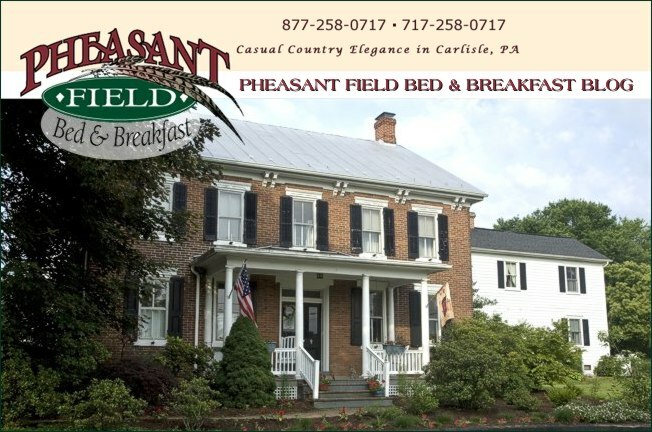 16 years ago today, we purchased the small farm that is now Pheasant Field B&B. After 6 months we opened the B&B and have not looked back. We started with 4 guest rooms and added the "Cottage" after about 5 years. Then in 2004, we opened the new addition with pet friendly rooms and our special luxury suite. Join us for your own Anniversary getaway. This is Parents' Weekend at Dickinson College and the Harvest of the Arts Festival in downtown Carlisle PA. I'm hoping to go downtown for some wonderful Apple Dumplings made by one of the local churches and sold at the Arts Festival. YUMMY! It's a busy, busy time here in the area with the Hershey car show AND the Penn National Horse Show also happening at this time. WOW - lots to do and see!